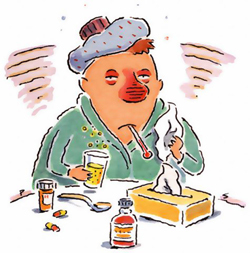 A cold and influenza (“The Flu”) are respiratory illnesses caused by different viruses. More than 300 different viruses can cause colds and influenza E.g.adenovirus, rhinovirus, parainfluenza virus, coronavirus. 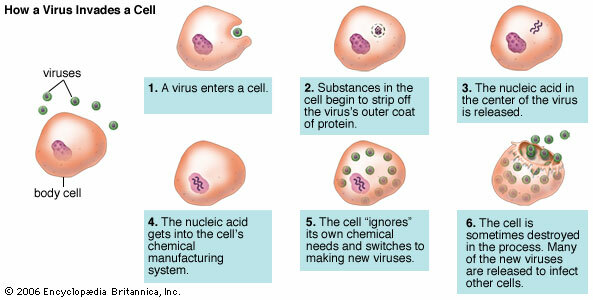 Much smaller than a bacterium, a virus is a tiny cluster of genetic material surrounded by a protein wrapper that uses host cells to create copies of itself –and in so doing, sometimes destroys the host's cells. A cold will last, at most, a few weeks, but allergy symptoms can last all season.